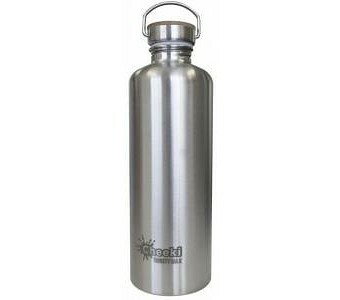 Extra-large water bottle for camping, family use and athletic events Durable, hygienic food-grade stainless steel with no BPA or other toxins Leak-proof bamboo lid with carry loop You always need water, but sometimes you need a lot of water! That’s where Cheeki’s big 1.6 litre Thirsty Max bottle comes in. It has the capacity to hydrate the whole family or the whole team, and since it’s a lightweight single-walled design (less than a third of a kilo) it’s also great for hiking and camping expeditions. The Thirsty Max features a natural (and leak-proof) bamboo lid, a narrow mouth for easy pouring, and a finger loop for easy carrying. Like all Cheeki products, it’s made from unlined premium Grade 304 (18/8) stainless steel and is 100% free of BPA and other toxins.